EOS token is a second generation cryptocurrency, which was still making use of the ETH blockchain until June of this year. As such, it fits into a slightly different gap in the market compared to your other cryptocurrency investments as its growth is still to be seen. This means that there is a large amount of room for growth and even for those looking to speculate on the price, EOS can be a good investment. Despite these differences, EOS functions in much the same way that other cryptocurrencies do from a pricing perspective. The price expressed via exchanges will be the average price – the median of transactions involving EOS to that point. This does not reflect its trading price though, which will depend on the amount, exchange, currency and time/date that you purchase. Cryptocurrency is volatile, with the price changing oftentimes by the minute. This price is based on what the seller is willing to accept and what the buyer is willing to pay. Exchanges set the price, even with new coins like Eos, according to this principle. Which exchanges can I use for my information? 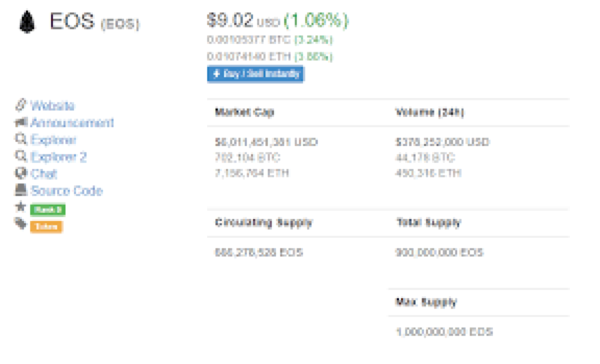 If you were to google EOS price today, you would find many links providing you with the current price, as well as graphs tracking said price. The information contained in these links/graphs is the median price of EOS. This price is not locked in, and you will still need to actually make a trade in order to assess what the actual cost of your EOS tokens will be. Does this mean that the information distributed via the various websites is worthless? No. It provides you with a strong indication as to the value of your EOS at that stage, allowing you to track the growth/losses of your investments over a set period, as well as allowing you a rough indication of how much you could leverage in a trade. All of the various cryptocurrency information websites are good for this purpose, given that the information used is more or less universal. Each of the exchanges that allow for purchase and trade of Eos will have realistic indicators as to its price. These are Binance, Coinswitch, YoBit.net, Huobi, Mercatox, Bithumb, KuCoin, altcoin.io, BigONE, Changelly and ShapeShift. Read every graph CAREFULLY. EOS prices are volatile and there can be a big difference between price changes over a week and those over a month/year.